The initial stage of exploration discovers basic details of the area of interest. TGS provides a variety of services to support Basin Reconnaissance, including Basin Modeling, Basin Temperature Modeling, stratigraphic chart definition and regional overviews. Sedimentary basins develop as a result of the relative motion between tectonic plates. This basic motion is a key element in understanding the basin architecture. The basin is then filled up with sediment, with each succession comprising a megasequence. A megasequence is defined as the gross sediment package deposited during a complete and major phase of basin formation. It is bounded above and below by unconformities. Megasequences and their boundaries are fundamental building blocks in basin analysis. It is vital that these formations are well understood. Once understood, the sequence framework and the prediction of a petroleum system can be defined. Megasequences and their boundaries provide the basic geometry of the basin where individual sediments are deposited to create sources, reservoirs and seals. The heat flow within the basin is crucial to the creation of hydrocarbons. Knowledge of these details helps create more accurate assessments of subsurface reserves. 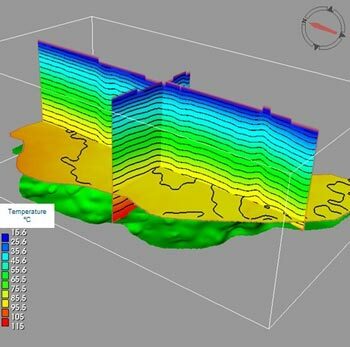 TGS can provide a substantial amount of Basin Reconnaissance data to meet your needs, including Basin Temperature Modeling. TGS develops reliable and dependable geological interpretations for hydrocarbon exploration and Basin Reconnaissance.